"Does this cake catch your eye? It is not only beautiful, but melts in your mouth it is so moist! It's a must try for any apple lover, I have done several variations, such as adding raisins, mango, and even bananas, and they have all come out great! Just play around with the recipe, adding your favorites, and it's sure to be a hit with your family!" Preheat oven to 350 degrees F (175 degrees C). Sift together flour, salt, baking soda, and cinnamon; set aside. Grease and flour an 8 inch Bundt pan. Whisk together eggs, oil, and 2 teaspoons vanilla extract until smooth. Mix in sifted dry ingredients until moistened, then fold in sliced apples, pecans, and walnuts. Pour batter into prepared Bundt pan. Bake cake in preheated oven until golden brown on top, and a toothpick inserted in the center comes out clean, about 1 1/2 hours. Stir together brown sugar, milk, butter, and 1 teaspoon vanilla extract in a saucepan. 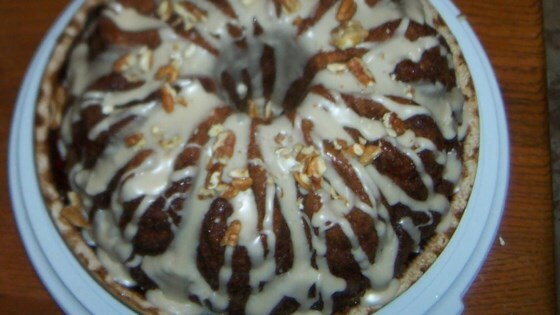 Simmer for 2 minutes, then pour over cake in the Bundt pan as soon as it comes out of the oven. Allow cake to cool in pan set over a wire rack until it is room temperature, about 4 hours. Whisk together mayonnaise, 1 teaspoon vanilla extract, and confectioners' sugar until smooth. Unmold cake and place onto a serving plate, spread icing over the top. This is amazing!!!! I have made it many times for diffrent events and everyone loves it! Cake very moist. I found it excessively sweet with the two cups of sugar. I will make it again adjusting the quantity of sugar probably by half. This was very good. My husband really liked it. I will be making it again, for Thanksgiving.